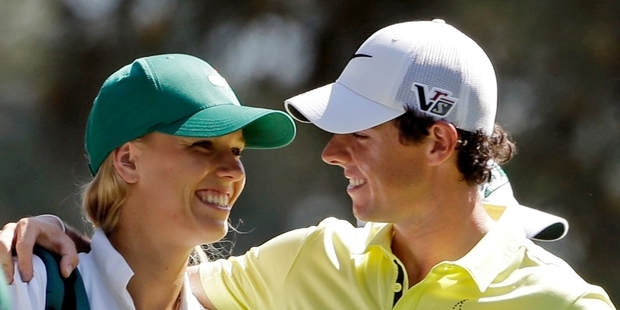 At the New Year's Eve fireworks display at Sydney Harbour, Rory McIlroy proposed marriage to his tennis girlfriend Caroline Wozniacki . Could this be another distraction for Rory as he tries to regain his number one in the world ranking ? Caroline and Rory / AP Rory used the firework display as the backdrop and a precursor for his own big bang announcement of his midnight proposal, employing Twitter to say; "Happy New Year everyone! I have a feeling it's going to be a great year!! My first victory of 2014 #shesaidyes!!" Caroline wasted no time to tweet back; "Happy New Year everyone! Rory and I started 2014 with a bang! ... I said YES!!!" The two former World Number Ones were at the New Year's Eve firework display in Sydney as Caroline prepares for the Australian Open starting on January 13. These two are not the first famous Golf-Tennis double act to get married, with Greg Norman - like Rory a two-time major champion - wedding fellow former world No1 Chris Evert in 2008, although the marriage lasted only 15 months. Not surprising as they could not even decide whose house they would call home, they both wanted to stay in their usual places. You would have thought they would have sorted that out before actually getting hitched. I wish the couple well and a long and happy marriage, wether they can both regain their number one status in each sport is a really fascinating event, which will keep the newspapers and magazines occupied through 2014.